Time to ditch the desktop? 2015 has already given birth to a new battle on the computing battleground: micro PC sticks. 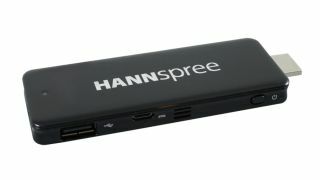 Taipei-based Hannspree is the latest to wade in with its PC on a stick, a 10cm-long dongle that turns any HDMI-equiped TV or monitor into a Windows 8.1 PC. It's powered by a quad-core Intel Atom Z3735F CPU, which according to Hanspree delivers a nifty peformance boost compared to previous chips because it's based on Intel's new Silvermont architecture. Onboard strorage comes in the form of 32GB eMMC internal memory, which can be expanded using a USB port on the rear and a microSD slot that supports up to 128GB cards. Connectivity options include Bluetooth and 802.11b/g/n Wi-Fi. The PC On a Stick is out now with an official price tag of £169, but you can get it from certain online retailers for a little more than £120. No word yet on global pricing or availability. The PC On a Stick joins a growing list of smaller PCs that includes Intel's Compute Stick, Zotac's ZBOX and The Hive's subscription-based Amplicity. Dell has also launched the Dell Cast, a "Chromecast for business users", a media streaming stick that allows users to stream the contents on certain models of the company's Windows and Android-based Venue gtablets.